Stainless Steel Round Mirror head, stainless steel mirror shaft and a highly polished chrome plated handle bar bracket. Fits 7/8" or 1" Dia. Handlebar. Originally manufactured by Stadium over 30 years ago and taken over by Halcyon about 20 years ago, this mirror continues to be manufactured in the UK . The only changes from the original mirror is the fact that the stem and head are now fully stainless steel as apposed to chrome plated, this has helped prevent eventual flaking and rusting problems. 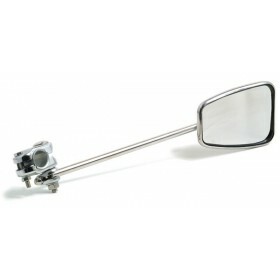 The Mirror clamps to the handlebar of your scooter or motorcycle securely with a high quality chrome plated clamp, the round mirror head can me adjusted along the stem and swiveled into position. The mirror is available with a 13" and a 22" stem.